Tree ferns are one of the largest groups of ferns. Widely popular among fern and palm collectors, most tree ferns have distinctive growth habits and are marked by a woody or fibrous trunk topped with a crown of sprawling fronds. Most species can grow to be massive ferns, however, some may be quite small. A few interesting species have trunks that creep or lie flat on the ground. Tree ferns add a unique and tropical look to any garden. 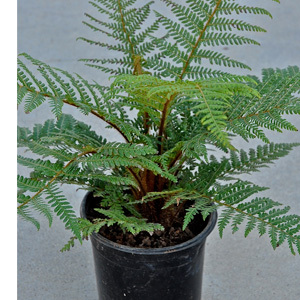 When you receive your Tree Fern shipment, you should immediately remove all packing and water the ferns. Most Tree Ferns are tropical or sub-tropical and need to be protected from wind, frost and never let dry out.